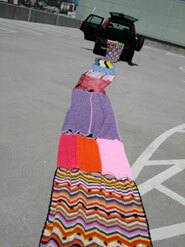 Instant Rest Stop consists of a 147 foot afghan blankets, made from 27 separate afghans. The blanket is rolled out from the back of a car, making an ideal instant picnic wherever we stop. Peanut butter sandwiches and lemonade are served as well as a local radio station can be heard from a specially made instant coffee cooler sound system. 15 local and international artists transformed cars into small exhibition units scattered in Los Angeles neighborhoods and traffic. Exploring the car as a "living room" as well as a symbol of personal freedom, identity, and privacy, a group-show was developed by Sonja Vordermaier, where exhibitions and performances took place within a convoy of vehicles. This driving exhibition poses the question of what happens when the rooms of a fixed museum begin to independently circulate and find their way to the city and its residents. 15 local and international artists transform cars into small exhibition units and scatter into Los Angeles neighborhoods and traffic. The Convoy merged at specific points and ended the day with a downtown parking lot party and film screenings.